March Madness found its way to the hallways of the O’Neal School as student, faculty, and staff embarked on the month-long March Madness Community Service Challenge. Throughout the month of March, the O’Neal community came together in a March Madness inspired Penny Wars bracket challenge to raise money for the Thirst Project. Thirst Project is the world’s leading youth water activism organization. They are a movement of high school and college students who build freshwater wells in developing nations and impoverished communities to provide people with safe, clean water. Thirst Project is a nonprofit organization that travels across the United States speaking at schools to educate students about the global water crisis and challenges them to fundraise to build wells. The campaign kicked off with Middle and Upper School students hearing from speakers from the Thirst Project who shared the goals and mission of their organization. “The speakers from the Thirst Project really hit home with our students, highlighting the realities that millions of people face across the globe who do not have access to safe, clean drinking water. Our goal with service is to educate students about the organizations we donate to and allow them to see the impact their fundraising will have on others,” shared Director of Student Life Lulu Brase. Competing in schoolwide Red and Blue teams, classrooms and advisories worked their way through a tournament bracket until they reached an ultimate winner on March 21st. Each classroom/advisory had its own jug to collect money. They gained points by adding pennies and bills to their jug. To lower other classrooms/advisories points, students added silver coins to another group’s jug. The initial goal was to raise 2,000 dollars this month, and after week one 1,500 dollars was already earned. 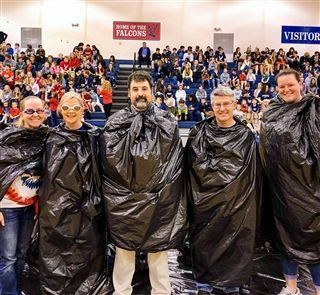 The stakes were raised to a goal of 3,000 dollars and it was met by a reward for the winning team to pie Mr. Elmore, Mr. Jacobs, Mrs. Andres, Ms. Manning and Ms. Brase. As the rounds continued, student excitement grew, and winning a round meant working together to gather coins and ask other grades for help. In the end, four teams advanced to the championship round: Mr. Williamson, Mr. McMurray, Mrs. Weeks, and Mrs. Wilder/Mrs. Morales advisories. In the end, the combination team of Mrs. Wilder and Mrs. Morales took home the impressive victory with 26,852 points in the final round. In the final day of the challenge, the O’Neal community came together for an “Hour of Service.” The rainy day couldn’t stop students from working together to clean up campus before the start of Spring Break. Grade levels worked together to beautify various parts of campus including classrooms, bleachers, theater, and much more. The grand finale brought everyone together to reveal our March Madness Community Service Challenge winners and the highlight of the month came as students cheered excitedly watching the pies cover faces. 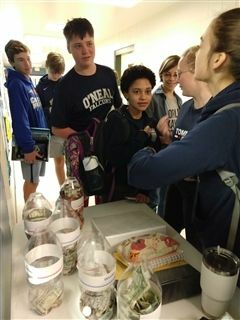 Together the O’Neal community raised 4,500 dollars throughout the Penny Wars challenge. In terms of water, this equates to a total of 45 families of four people or 180 total people who will receive clean, safe drinking water for life. “It’s incredible to think the impact we’ve had through the penny wars challenge. 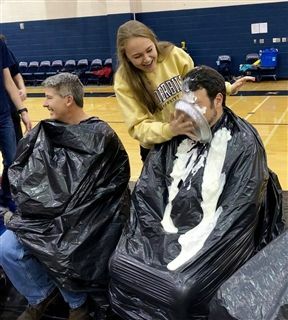 We’ve come together as a school community in a tremendous way to raise money for an important cause, all the while having a terrific month of fun competition as a community,” reflected Ms. Brase.